مملكة البحرين هي دولة تقع في وسط الخليج العربي شرق السعودية وشمال قطر في جنوب غرب قارة آسيا. يربطها بالسعودية جسر الملك فهد (الذي افتتح في 25 نوفمبر، 1986) يمتد لمسافة 25 كم تقريباً من مدينة الخبر في السعودية. كما سيربطها بقطر جسر قطر البحرين الذي تم التخطيط له، و الذي سيكون أطول جسر في العالم و يقدر طوله ب 45 كم. The Kingdom of Bahrain is a borderless island country in the Persian Gulf (Southwest Asia/Middle East, Asia). ► Saudi Arabia lies to the west and is connected to Bahrain by the King Fahd Causeway (officially opened on November 25, 1986), and ► Qatar is to the south across the Persian Gulf. The Qatar–Bahrain Friendship Bridge, currently being planned, will link Bahrain to Qatar as the longest fixed link in the world. 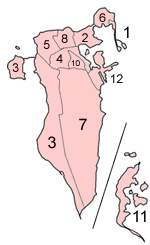 In terms of geographic size Bahrain is the smallest Arab country. More images Bahrain - Bahrain (Category). This section holds a short summary of the history of the area of present-day Bahrain, illustrated with maps, including historical maps of former countries and empires that included present-day Bahrain. The site of the ancient Bronze Age civilization of Dilmun, present-day Bahrain is an important center linking trade routes between Mesopotamia and the Indus Valley as early as 5,000 years ago. The Dilmun civilization declines about 2,000 BC. Shortly after 600 BC Dilmun is formally incorporated into the new Babylonian empire. Bahrain, known as Tylos, is later ruled ruled variously by the Arab tribes of Bani Wa’el and Persian governors. This map shows Bahrain under control of the Parthian Empire (250 BCE-226 CE).